Vedanta literally means just the end portion of the Vedas i.e. the Upanishads. But Bhagavad Gita and Brahma Sutra are also included in Vedanta because the subject matter, which is knowledge of Oneself, is the same. Vedanta is the enquiry of "Who am I" done with the help of the scriptures. Why should I study Vedanta? Know more about myself, why I am here on the earth, what is the purpose of life, what is karma and so on. Learn to face desirable and painful experiences with the right attitude i.e. maintain an equanimity with regard to both. Not go overboard with celebrations of happy events or get excessively depressed with sadness. Understand the difference between religion and spirituality and also their inter-connectedness. Also understand the profundity of all facets of Indian culture, like Arts, medicine, finance, administration, Yoga, festivals etc and how all are designed towards the one goal of Moksha. What is the ultimate purpose of studying Vedanta? Moksha or freedom from the cycle of birth and death (Samsara). This is accomplished only by the knowledge of the truth of myself as different from what I have identified with viz. the body-mind-sense complex. This identification is the root cause of all human problems like sadness, fear, anger, hatred, jealousy and so on. Enquiring into the basis of this identification and getting rid of the mistaken identity is the real purpose of studying Vedanta. 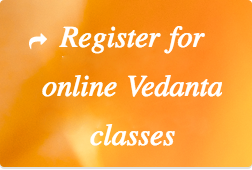 Who is eligible for studying Vedanta? Any human being irrespective of religion, nationality, caste or gender is eligible as long as the person is sincerely committed to finding out the primary reason for taking birth in this world and his/her relationship with the external universe. And more importantly has complete faith and trust in the Upanishads as a valid means of knowledge for knowing the ultimate reality. At what age should I start study of Vedanta? Ideally it should be started in the 20s but it is best to start at least before the age of 45. Vedanta is like a life manual. It should be used to live life properly and not after we have finished living and are waiting for the end. Postponing it for later life is unfortunately not very helpful and not the right thing to do. One can continue to pursue it in old age but starting after retirement is not useful because one attitudes, ideas about life, priorities and behavior are already hardened by then and it is difficult to start changing at that point. So earlier the better it is. Many people unfortunately reason in their younger days as being too early for Bhagavad Gita etc. But who knows what our destiny is and how long we are going to be around? Life is not meant to be wasted only for chasing "dreams"..
Do I need to know Sanskrit for studying Vedanta? Knowing Sanskrit is helpful but it is not a pre-requisite. If desired it can be pursued simultaneously along with the study of Vedanta. How long will I need to study Vedanta? Vedanta is a lifelong pursuit. It is a pursuit of the knowledge of the truth of ourselves and the world around us. It is not a time bound "course" like 1 week, 1 month or so because Vedanta is not a technique like Pranayama or even meditation. On the contrary it is knowledge that destroys the fundamental ignorance of Who I am. The study ends when I firmly gain that Self knowledge. And naturally the time taken for it varies for each individual. There is no fixed time frame. The key to the pursuit is enjoying the process rather than being desperate to reach the end. The means is an end in itself. Will Vedanta make me lose interest in the real world - family, career etc or make me under-achieve? No, it will not. In fact it will make my life more purposeful. Lord Krishna was always encouraging Arjuna to fight and was dissuading him from running away. So Vedanta teaches us about the truth and purpose of life and does not make us run away. Vedanta teaches one to be the best one can be and hence there is no question of under achievement. Vedanta also helps me understand the pitfalls of mindlessly following the rat race! Will Vedanta help in my career growth, improve my management skills etc? That is not the intended benefit of studying Vedanta. As mentioned earlier the main purpose of studying Vedanta is moksha (freedom from this cycle of birth and death). Rest is all incidental and hence immaterial from the absolute stand point. Do I necessarily require a Guru to understand Vedanta? The answer is a definite Yes. Because knowledge is abstract and subtle, the subject has to be handled by a competent teacher to make it practically relevant and useful. The teacher in turn should have learnt from another person who belongs to the unbroken lineage of teachers starting from the Lord himself. He should NOT claim to have been self taught. This is essential because only knowledge that is available to sense perception (eyes, ears, nose, tongue and skin) can be discovered by a human being on his/her own. The truth of myself (Atma or consciousness) is not available for sense perception and so cannot be discovered accidentally. It needs to be revealed by an appropriate means of knowledge, which we call Vedanta. And this revealing process also has a methodology built into it and that is where the teaching tradition plays a crucial role. Hence, a Guru/teacher is an inevitable and unavoidable component in the pursuit.. But yes, getting the right teacher is a result of pure grace which is nothing but an outcome of my sincerity and commitment. Can Vedanta not be "googled" and known? Google alone does not help much because there are so many differing ideas and it only leads to more confusion. It is impossible to wade through a billion search results and understand myself properly. If one wants to attempt that then we can only wish "best of luck"! Will I get mystical experiences? No, Vedanta is a knowledge tradition and it just reveals the truth as it is. Subjective experiences can never be the truth and are definitely not promised. This does not mean to say that no one should have such experiences. We only say that it is not the purpose of pursuing Vedanta. In fact mystical experience can also many times be a hindrance in the pursuit of the truth.